In a few of my previous posts I have mentioned former single male flatmates who seemed to believe in “the magic bin emptying fairy”. It seems I have caused a little confusion by using this term. Well, some bloggers understood immediately what I was talking about, whereas others seemed puzzled. So I am going to try to explain to clear up any confusion that lingers. There are those flatmates, house-mates, even members of one’s own family or household who seem unawares of a supreme truth. Someone, and by that I mean a human, not a fairy (often a woman, but there are some exceptional men) is actually behind what may seem miraculous or magical. For example, Ella and and I were the ones who emptied the bins in our flat. 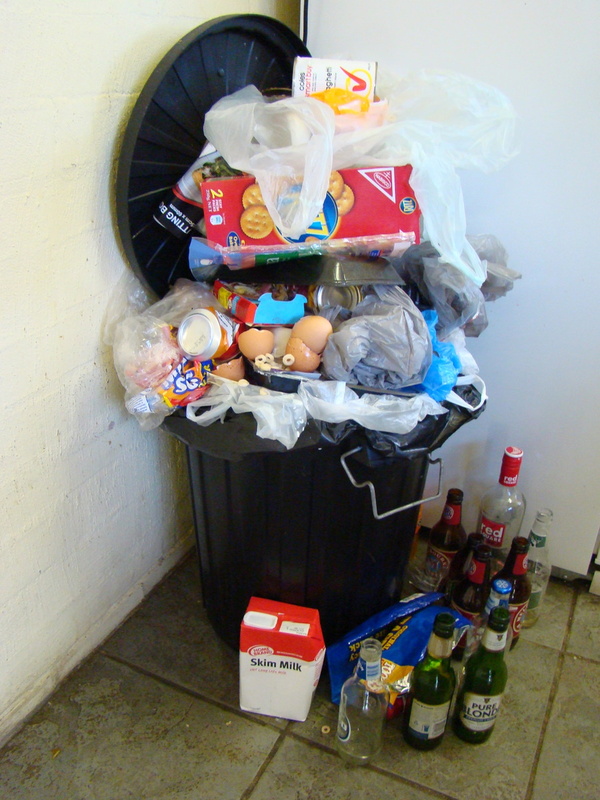 In addition to emptying the bin, we wiped the bin, the walls and the floor surrounding the bin. The male residents of our flat seemed to go to further extremes each week in their carelessness. Coffee granules, tea-splashes, sauce stains and unidentifiable substances were smeared all over the walls, floor and the bin itself. Now the boys…well, they never thanked us, they never thought to help by emptying the bin themselves. If Ella and I were away, we would come back and discover the bin was literally over-flowing. Ella tried to “enlighten” the boys…but they obviously were convinced that they had been specially chosen by “the magic bin-fairy”, whereas Ella and I had not been favoured by her. It was not just emptying bins. They seemed to believe in the magic dish-washing fairy, the magic toilet roll stocker-upper fairy, the magic fridge shelf wiping and mouldy food disposing fairy, the magic picking clothes up off the floor fairy…the list goes on and on! I have laughed about it with Goldfinch. He has two new house-mates at the moment who are clearly not particularly domesticated. He showed me this video, of an Australian comedian who highlights this belief I have been referring to – there is a swear word at one point. I like my site to be suitable for all ages, but this video…if you are under I don’t know which age, but just to mention it contains one swear word, just in case you are like me and feel shocked when you hear bad language. Anyway, this brilliant video does a great job of highlighting the situation I have been referring to. If you believe in magic coffee-tables, magic laundry baskets, magic bin emptying fairies or any other household miracles or domestic magical occurrences – please feel free to ask questions and I will try to “enlighten” you. My other half definitely believes in magic fairies and has done so for over 40 years! Yup! I feel no remorse! I showed the video to my wife and she went hysterical. So absolutely, bloody, funny. She reminded me of a comment I had made to her a while ago, about the magic drawer I had in the bedroom, where socks and underwear were mysteriously replenished whenever they reached a certain low level. It’s scary that all men think alike…….well perhaps not all. I wish I had seen that. It really is a funny clip isn’t. You had a magic drawer in your bedroom! It is funny half of my male friends laugh and agree with the whole household magic concept, but the others seem to take offence and start telling me how highly domesticated they are. I try to reassure them not to worry, this teasing is only for those who do not want to believe anything else than it is a magic coffee tab;e/laundry basket/magic bin emptying fairy!